Since we began running last year, the PugRunner family has accumulated quite a bit of hardware. While I know medals aren’t important to some runners, they are incredibly meaningful to me. Each has a story and many memories behind it, and I love seeing them hanging on display. The only problem was that we didn’t have anywhere to really hang them, or our collection of race day bibs. I’ve been saving those methodically, divided into piles for each of us, marked with the name of the race, date and time, while the medals were hanging on the supports of a bookshelf in our bedroom (little man’s were pinned to the bulletin board in his room). I went so far as to pick up some supplies at the craft store to make my own medal racks: unfinished wood boards, sawtooth picture hangers, and a variety of decorative hooks and paint, but inspiration never really struck. In my head, I kind of knew what I wanted, but for some reason, I couldn’t visualize how to make it happen. And so everything sat, untouched, in the coat closet. A few weeks ago, I had had enough. There were some decorative things I started doing in the house, and I decided it was time to figure out the medal situation. Off to Etsy I went. I wasn’t entirely sure what I was looking for, so I just started poking around and in minutes, this popped out at me from York Sign Shop. I had no need to look further. I absolutely loved the idea of having one hanger for me and Mr PugRunner, and so I ordered this, as shown, with an extra row of hooks and a beveled edge, and then sat back to wait for the mail. Within a week, it arrived, perfectly packed and absolutely exactly as I envisioned. I was so happy to start filling it up. I ordered some of my favorite running photos, picked up a few gallery frames, and set to work on a huge wall in our loft. and surrounded the medal holder with some of our framed photographs. As you can see, we’ve pretty much filled it up (Mr PugRunner has one more hook on his side, and I have doubled up on a few hooks on my side), so I think I will have to go ahead and order us each one of these smaller medal racks to hang under the frames on either side. They can be customized with our names or maybe a powerful saying for each of us. I will think on it. Little man still likes his medals in his room where he can see them. I am so in love with how this has turned out so far. And I can’t wait to continue adding to it! Do you ever go on crazy redecorating jags? In the last month, I can’t tell you how many wall frames I have bought to create new galleries and collages. Tell me I’m not alone. If you keep your race bibs, do you label them with info from each race, or just leave them alone? You definitely do! I imagine you’ve got a ton of stuff to show off at home! Mary Beth Jackson recently posted…The Box! I gotta have it! I write my times on my race bibs. They’re not displayed, though. I have them clipped on a loose leaf ring and they’re in the closet. Only my medals are displayed. It’s a great way to keep track of those numbers. I love having my times right there on the bibs. Love those medal hangars! I really like that they display the bibs as well. Looks great! Hey! You can comment again! Yay! I absolutely loved that the medals and bibs were together on the hanger. I love when things are in one place. That is so cute. I love the Sole Mates. I absolutely love Etsy. I got my runner girl necklace and My Run Like a Girl Necklace there!! Way to go on so many races in a year!! Etsy is the best! I am forever trying not to spend money there. That looks great I only hang the bibs that have race names on them. I keep the rest. LOVE the medal holder for the two of you and like how you displayed it on the wall with the pictures on either side. Thank you! I do tend to buy race pics, and I’m so glad I finally got to pull them out of the envelopes and hang them up. 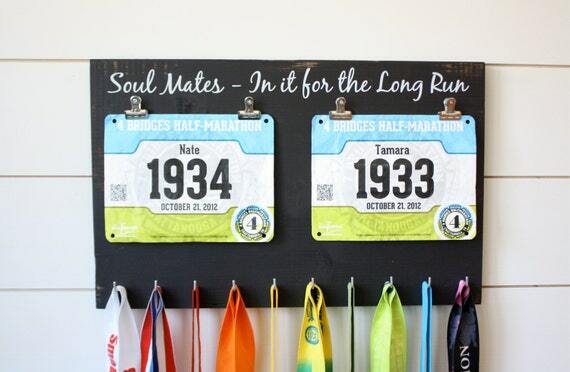 That’s a very cool medal/bib holder, and I love that you found exactly what you wanted. Isn’t it great when that happens? Your loft wall has come together nicely with the race photos, medals, and bibs displayed on it! I have our medals hanging on the wall in our basement gym. I used expandable cafe curtain rods to make them and love how they turned out. I keep my bibs in a folder, but my husband throws his away. I write the race name (if it’s not on the front), date, my time, and where I placed out of my age group on the back of the bib before I put it in the folder. That information was very handy to me when I wrote all of my throwback recaps this past year! I am totally jealous of your basement. We don’t have them here, and it really cuts down on space for things that aren’t quite “fine art for public display.” Using curtain rods is a genius idea! LOL! I do all my own patching and painting, so I am free to hammer and nail away at will. Cute! My husband made one for us, but I have a feeling we will need a second one pretty soon. I like that you added the pictures from races. I may do that as well. We are about to move, and we will have this extra office/den room. I wasn’t sure how to decorate it, and now I think I will make it the running room. Perfect! We have all our other sports memorabilia in the office, but there’s not a ton of wall space, and that’s more Mr PugRunner’s domain, so I didn’t want our things holed up in there. Gabriella recently posted…Week recap… plus Vega protein powder and Blender Bottle review! Report back and let us know how it comes out! The wall looks amazing! I’m so impressed! I save my race bibs too. Currently they’re in a big stack on a shelf in my laundry room… Probably should think about doing something a little more productive with them! There are so many great ideas for display: a hanger, a binder, framing them all in a giant collage, etc. I’m sure you’ll come up with a great way. Holy cow, that is a LOT OF MEDALS! What an awesome way to display them too!! jan recently posted…TOO. MANY. CHOICES. I love my bling!!!! It’s so nice getting to see them every time I go upstairs. Oh my gosh that is so neat! What a cute concept. I am always awed by how many races you complete, but visually seeing all of those medals, dang girl, I’m impressed haha! I don’t know if I’ve even averaged one per month, since I’ve started. A couple of those medals are from virtual races, too. Because if I was going to complete a distance for the first time, it was nice to have a little something to commemorate the accomplishment. I’ve slowed down a bit, too. In the beginning, it was RUN ALL THE RACES!!!!!! But now I’ve settled down a bit and am being a lot more selective about my race schedule. 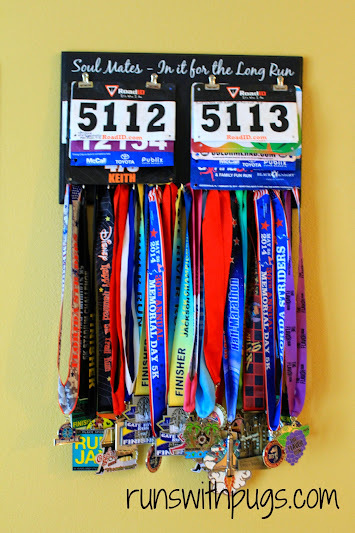 love this idea so much, I have been playing with the idea to make my own medal holder. currently my medals are hanging over a wine bottle… err… ya. haha! Hey. Wine bottles are awesome. I can see how the two go together perfectly!